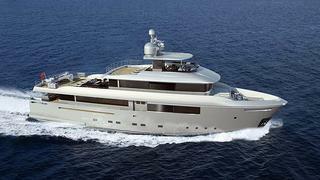 Hong Kong’s Kingship yard has announced a new Ocean SUV Series, a combination of luxury yacht and expedition yacht. The idea started from a desire to build a yacht combining safe, economical and long range capabilities yet offering high levels of comfort, storage and practical interior layout making them suitable for world cruising without frequent stops to restock. This unconventional design by Sergio Cutolo at Hydro Tec of Varazze, Italy is comparable with the functional characteristics of an SUV/4-wheel drive car. However, unlike the gas guzzling car, they are extremely low in fuel consumption and can go long distances without making frequent stops for refuel. They come in 3 sizes of 90’, 116’ and 150’and their range will be 5,000nm, 7,500nm, and 9,500nm respectively. The uncluttered exterior is frill free, easy- maintenance and offers passengers a high vantage point from which to view the passing scenery. All spaces are highly practical and even the 90’ does not compromise on providing for 10 guests and 4 crew. The 116’ has a full- beam main- deck master for maximisation of space and an internal elevator connecting all decks can be added as an option upon owner’s request for the116’ and 150’ series. Extensive exterior and dining facilities can also be found on all decks for relaxation and entertainment. The SUV 90’ will be classed RINA/MGN 280 Code category 2 while SUV 116’ and SUV150’ will both be in compliance with RINA/MCA LY-2 unlimited.